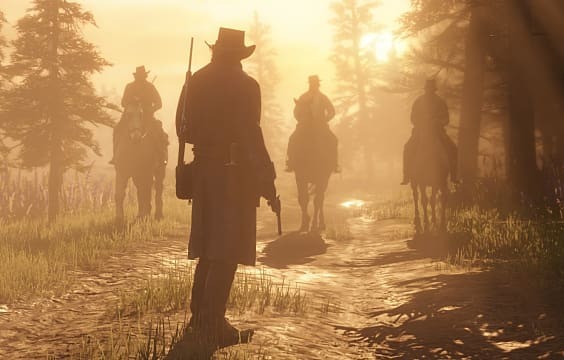 Red Dead Redemption 2 is poised to be one of the most explosive games of the fall. Following Arthur Morgan, an outlaw on the run with the Van der Linde gang after a robbery gone wrong, the follow-up to 2010's Red Dead Redemption is actually a prequel that's been on almost everyone's games list for eight years running. In fleeing from federal agents and bounty hunters, Arthur and the gang must rob and steal as they make their way across Wild-West America to survive. It's an adventure you're not going to want to miss. 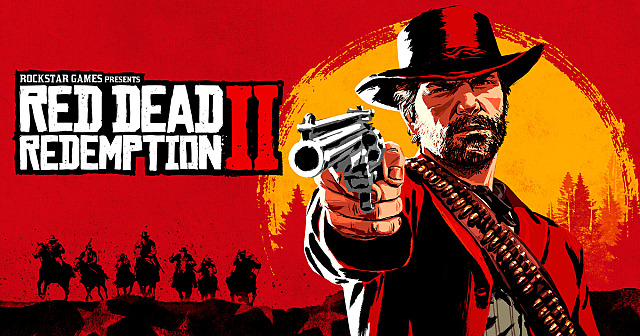 Coming on October 26 to PlayStation 4 and Xbox One, you'll want to be sure you get your hands on Red Dead Redemption 2 on launch day. 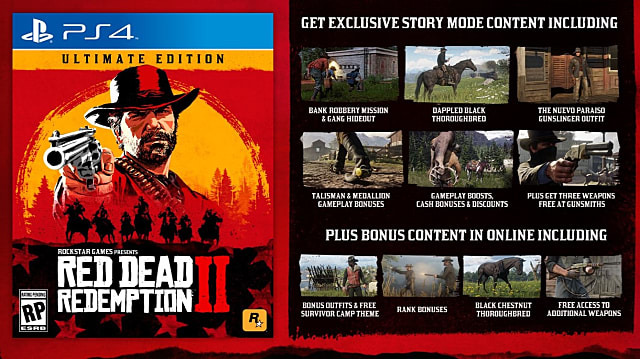 This pre-order guide will lay out all of the game's pre-order bonuses, as well as what comes with each edition of this Old West epic. Every version of Red Dead Redemption 2 you pre-order will include two enhancements in the game's story mode. War Horse: This is a handsome iron-grey-colored Ardennes War Horse that can always be relied on in the heat of battle. It is said to have greater courage and stamina than the average steed. Outlaw Survival Kit: This kit contains several key supplies to help make life on the frontier easier, such as items to replenish Health, Dead Eye, and more. In addition to the bonuses mentioned above, if you purchase digital pre-orders on the PlayStation Store and Xbox Store, you will also receive certain bounses. 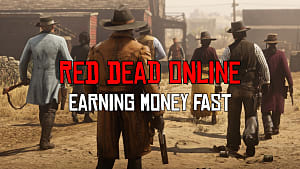 Extra Cash Reward: This reward is for the game's story mode, and it gives you enough in-game money to buy a weapon, some food, a handful of useful items and ammunition. Bonus GTA Online Money: All digital pre-orders will receive an immediate infusion of GTA money to their Maze Bank accounts in GTA Online. 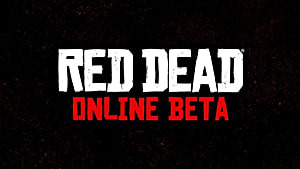 If you make your digital pre-orders for Red Dead Redemption 2 through the PlayStation Store, you will receive an automatic download for the bonus GTA Online money. If you pre-order from the Microsoft Store, the GTA Online money will be delivered to your Xbox message center within 7-10 days after your pre-order. Your code can be redeemed on your Xbox One or Xbox.com. 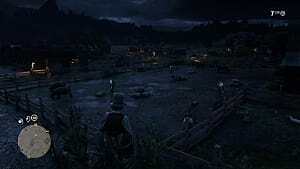 What Comes in RDR 2's Different Editions? 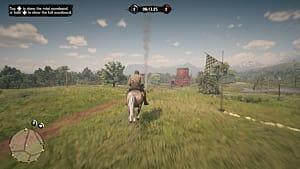 As with most games these days, there are also several different editions of Red Dead Redemption 2. Each edition (sans the standard edition below) has other added bonuses alongside their pre-order bonuses. 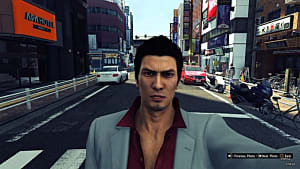 The standard edition of the game can be purchased either physically or digitally for $59.99. 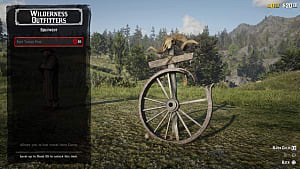 It comes with the pre-order bonuses of the War Horse and Outlaw Survival Kit as mentioned above. There are no other bonuses for this edition of the game. 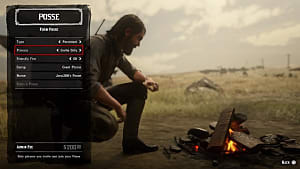 Bank Robbery Mission and Gang Hideout in Story Mode: Get exclusive access to a Bank Robbery Mission, where Arthur and a couple of his fellow gang members come up with a plan to rob the bank in the southern town of Rhodes. 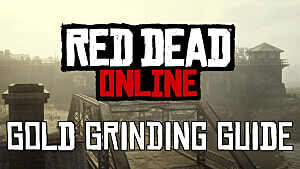 You'll also get a Gang Hideout, where you can clear out another gang’s hideout and rob their stash. Dappled Black Thoroughbred: This racehorse will keep you at the front of the pack because of its exceptional speed and acceleration. Not to mention, you also get the exclusive Nuevo Paraiso Saddle as another bonus. Talisman and Medallion Gameplay Bonuses: These items will give Arthur a bit of a boost whenever they are equipped. Each has its own unique feature, such as allowing certain skills to last longer and receiving less damage. 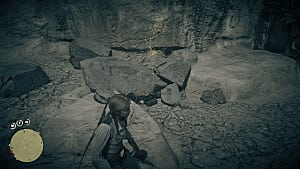 Gameplay Boosts, Cash Bonuses & Discounts: With these boosts, bonuses, and discounts, Arthur will have a better chance of surviving in the harsh wilderness and have better chances to provide for his fellow gang members and their camp. The Nuevo Paraiso Gunslinger Outfit: This outfit features a wide brimmed black cowboy hat, deep indigo coat, worn denim chaps, leather gloves, and boots. While it does not have any special features, it keeps Arthur looking pretty sharp. 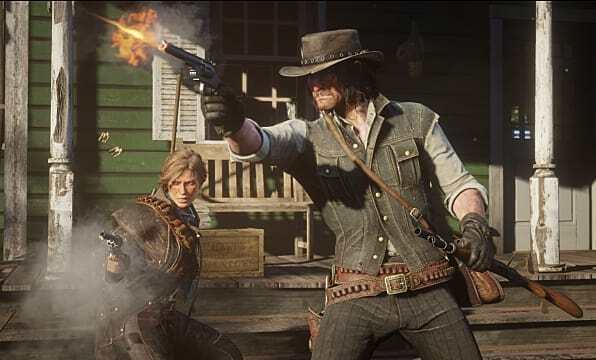 Free Access to Additional Weapons: If you’re going to survive in the Old West while you’re on the run, you’re going to want a few additional weapons to make your battle easier. You will get free access to three weapons at the in-game Gunsmiths in Story Mode -- the Volcanic Pistol, the Pump Action Shotgun, and the Lancaster Varmint Rifle. Bonus Outfits: You can get two online outfits for your character, the Blackrose Bounty Hunter Outfit and the Copperhead Enforcer Outfit. Black Chestnut Thoroughbred: You’ll receive another excellent thoroughbred to help in outrunning the competition. Not to mention, you get another saddle, the exclusive High Plains Cutting Saddle. Free Access to the Survivor Camp Theme: Getting to customize your own personal Camp in online mode with free access to the Survivor theme will give you something new to look at. Rank Bonuses: As extra incentive for all Ultimate Edition players, you gain the ability to rank up faster in online, making it up to Rank 25. Will you be pre-ordering Red Dead Redemption 2? If so, let us know which version of the game appeals the most to you in the comments!